Midas and Klark Teknik have launched a raft of new products at InfoComm 2010 in Las Vegas comprising two additions to the PRO Series, the PRO3 and PRO9; the XL8i; a new range of Midas digital snakes and new digital audio format and sample rate converters from Klark Teknik. The PRO9 tops the Midas PRO Series, providing an 88 channel input count and 35 buses, while the cost-effective Midas PRO3 is designed to ensure that more touring riders and professional installations can take advantage of Midas’ digital features. The XL8i is a top-of-the-range addition Midas’ digital audio line-up created with the install, theatre and house of worship market in mind. All the new systems use the same technology and components as the XL8 and PRO6. The Midas PRO3 includes the VCA and POPulation groups which allow users to navigate channels intuitively. PRO3 is designed to feature the legendary and much-loved Midas sound characteristics which have their roots in the classic Midas analogue boards. The PRO3 also benefits from the same comprehensive choice of effects and dynamics processing as the PRO6 and XL8, including the much-acclaimed XL8 compressor options. The PRO3 brings these features and more within reach of tighter budgets, offering 48 input channels with remote controlled mic pres, 27 buses and six stereo effects. At the heart of the PRO3 is another new arrival from Midas, the DL251 fixed format, 5U I/O rack, designed as a more cost-effective solution for those not requiring the flexibility of Midas modular I/O hardware. 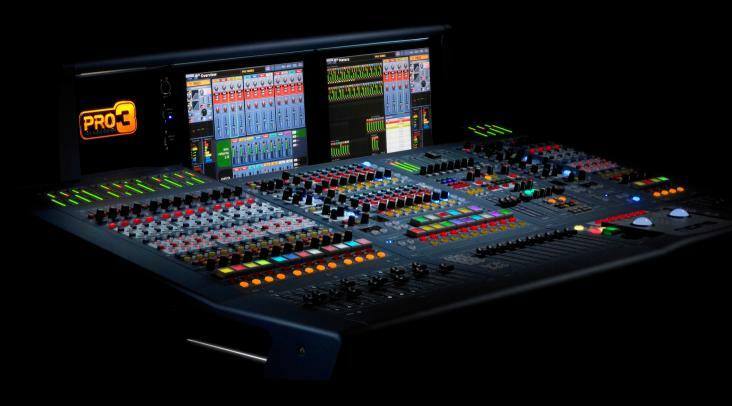 However, should investors require more connectivity over time, a simple and affordable upgrade path supersizes the system to the fully-loaded, 88-channel PRO9 with additional hardware and firmware upgrades. Technical details include sample-synchronous audio quality with all audio time and phase coherent, daylight-viewable screens, sampling in 24 bit, 96kHz quality, included 192 x 192 channel bi-directional snake, up to 288 inputs and 294 outputs patched and routed on a scene-by-scene basis, in-ear-monitoring-safe low latency, dual solo busses for in-ears and wedges, and ‘Area B’ for quick and easy access to selected inputs.